BRAMPTON, ON – Local youth-run organization ACCESS Charity presents the first ever Arts for Change Talent Show on Friday June 25, 2010. The fundraiser has support from the Brampton Mayor’s Youth Team and the Mayors Youth Advisory Committee of Mississauga. ACCESS: Allowing Children a Chance at Education has been responsible for an array of initiatives promoting social change including their annual School Supply Drive, Youth Making a Difference Workshop, and school presentations. 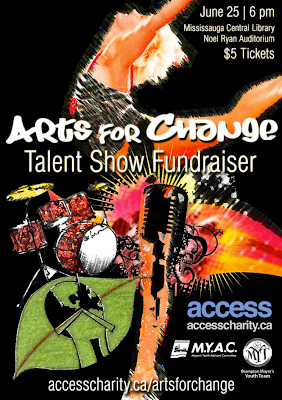 On June 25, 2010 ACCESS will continue to climb the ladder of youth activism with their Arts for Change Talent Show. The talent showcase will be held at the Noel Ryan Auditorium in the Mississauga Central Library beginning at 6:00 pm. Tickets are available for $5.00 at the door, and in advance through ACCESS and select local high schools through the Brampton MYT and the MYAC of Mississauga.The event is a fundraiser designed to support projects in Haiti and other developing countries including Tanzania, Africa. Proceeds will be used to purchase school supplies and help provide ways that youth can draw closer to the educational advantages offered in North America. Arts for Change is a unique way to raise awareness about ACCESS along with an opportunity for young, talented youth to get their “big break” in front of peers and a youth-oriented, non-profit organization. ACCESS encourages anyone in the Peel Region and beyond to come out and enjoy what the members of their community have to offer, while supporting the cause of global education. For any inquiries, you are invited to visit the Arts for Change webpage at www.accesscharity.ca/artsforchange. If you are interested in making a donation or are able to be a sponsor for our event, please feel free to contact artsforchange@accesscharity.ca. ACCESS appreciates your support and reminds you to be a pioneer of change in your area!